When they come for the home of Nurse Maggie McWhite, will the neighbors of Homeville stand up for what's right? Jillia explains her creative vision for the next scene to Becky while Cat sketches in the background. Photo by Mark R. Brown. The illustrations for this book draw from a phenomenal talent pool. 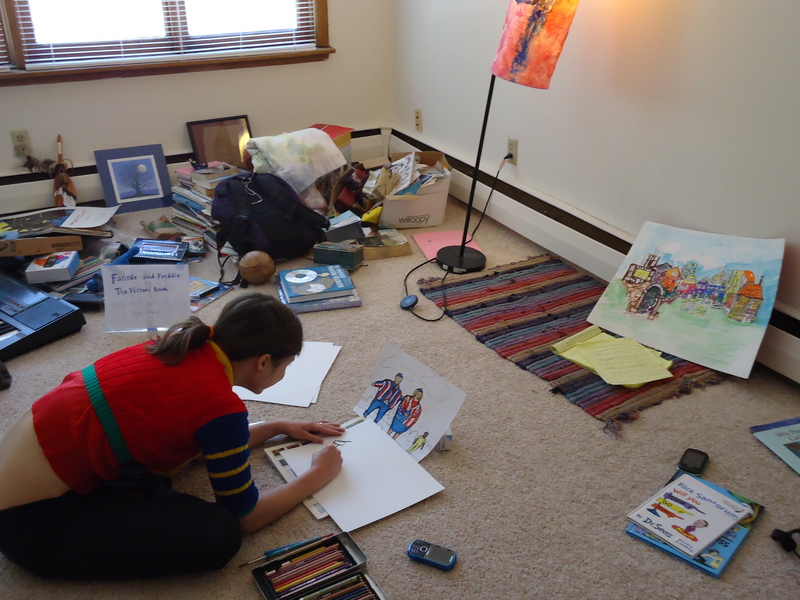 We pooled our art supplies and children’s books and turned Becky’s unfurnished apartment into an illustration studio as everyone spread out on the floor and worked together. Connie drew our main Homeville backdrop. Dan stopped by almost unannounced and whipped up an incredible Vegas scene out of his head. Eva spent hours upon hours perfecting our three main characters. 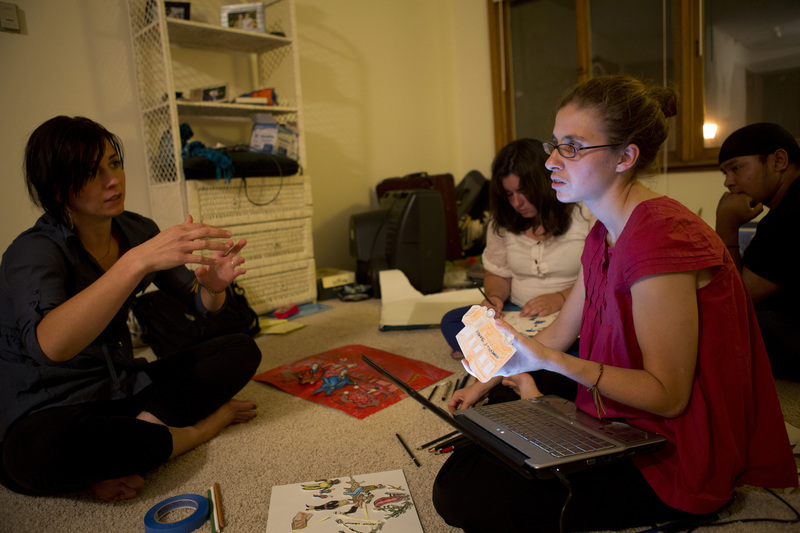 Caylin, Kat, Cat, and Becky worked on miscellaneous characters and props. Becky found the ocean on a postcard Elizabeth painted in 2005. Then Jillia drew from her theater background to be our artistic director, arranging all the characters and props in different scenes. Mark took amazing photos. Meanwhile in Seattle Bill stayed up all night finishing up the graphic design. As a result we created an incredible collaborative process, which was not only really fun but also produced what we think are really stunning images. 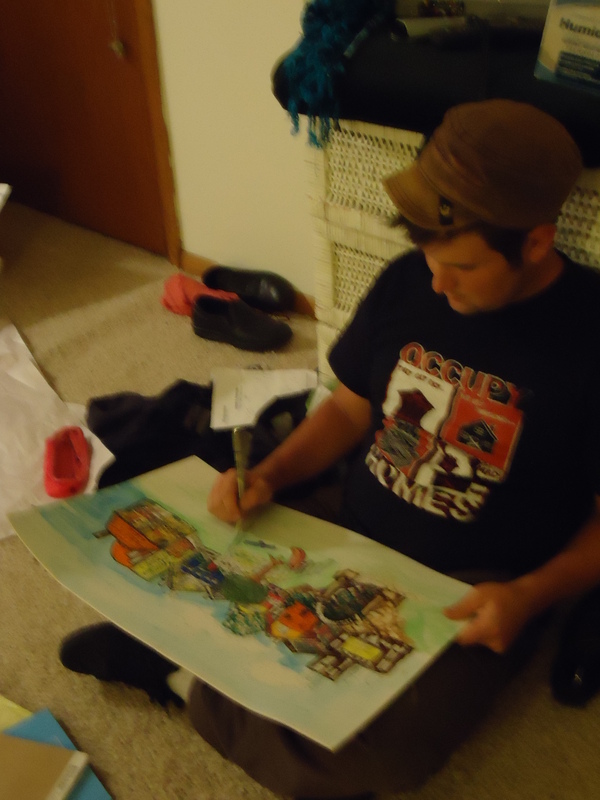 Here’s a look at how the illustrations came together. 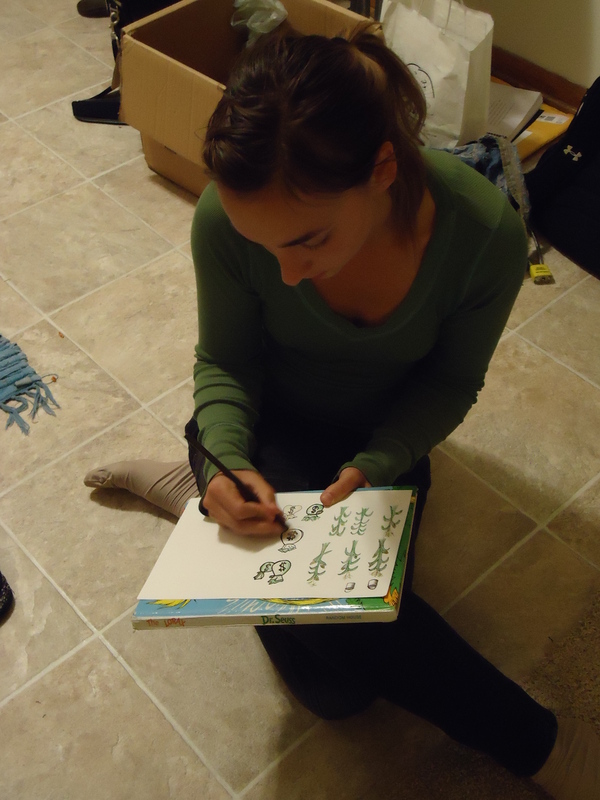 Eva prepares her final version of Fannie and Freddie, using Connie’s Homeville for reference. Photo by Becky. Kat has finished the corn and moved on to the moneybags. Photo by Becky. Dan has finished Vegas and is now making accessories for Homeville. Photo by Becky. Wow! Ideas to book in one evening! Let’s support this great work! Fannie and Freddie at Anarchist Book Fair!